Posted on 03/12/2018 at 05:24. 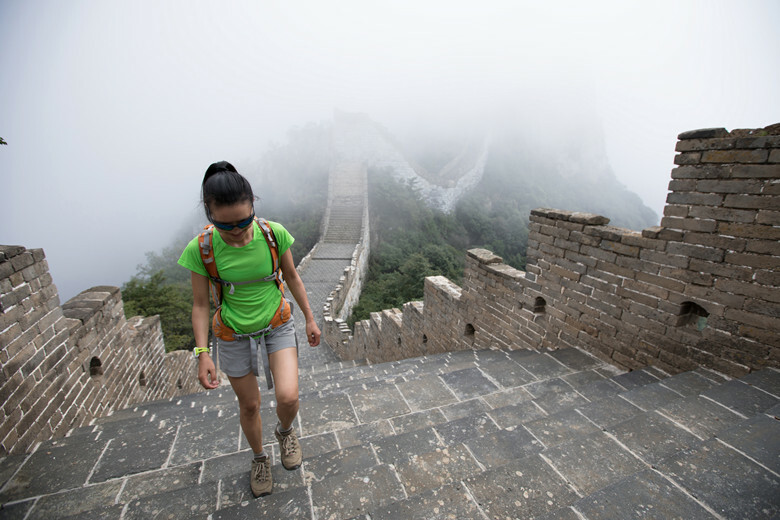 Summer is probably the best time for hiking the Great Wall of China, yet you can often feel like it’s the worst possible time to be outdoors. Clear, sunny skies, and longer daylight hours can translate into an amazingly full day on the Wall. But these skies and long days can bake you in the heat. When the temperature rises, it can become difficult to keep yourself motivated and calm. You can still enjoy the stunning Great Wall in the same hot weather. You just have to adjust the way you think, and take a few extra precautions beyond the basics. You don’t have to let high temperatures keep you from experiencing this amazing landmark. Not everyone likes to wake up early, and your trip doesn’t have to feel like you are going to work; just find a balance between the amount of sleep you need and lowering your exposure to afternoon heat. It typically involves a 2.5-hour drive from Beijing into Jinshanling or Jiankou. Waking up before 6.30am in the Summer months is highly recommended. Skip the midday heat, don’t hike between 11 a.m. to 2 p.m. Hike during the coolest time of day. Don’t just assume that you’d be fine on the Wall. Hot weather comes with a number of risks. It is crucial to check on the forecast before you plan the trip. In the mountainous area, keep in mind that weather in the mountains is generally colder and more severe than in the valleys, and the weather can change quickly. The rays from the sun are also stronger from a mountain top, and you’ll get burned faster – even more so if you are sweating consistently. Humidity could be a signal for rainfall. Be prepared in advance. Thunderstorms are more common when it’s hot. Keep yourself safe in all situations. Before you set out, make sure you have checked over the most up-to-date forecast for the area you’ll be hiking. When it comes to hot, dry and humid weather, your skin needs the adequate protection. Sunburns can damage your skin. They also affect body’s ability to cool down, which increases risks of dehydration. Loose fitting pants and sleeves with wide-brimmed will do wonders on a summer hike. The more you are able to protect your skin from the rays of the sun, the happier you will feel. Apply sunscreen that offers at least a SPF 30, 30 minutes before heading out. Put it underneath your clothes as well. Wear a hat or head covering to ensure that your head and neck does not get too hot. Also, do not wear cotton as it is one of the worst fabrics while hiking. Staying hydrated is the key to every successful outdoor adventure. This is particularly essential when you’re hiking the Great Wall in extremely hot weather. If you decide to hike in the summer months, dry and hot conditions along with physical exertion can cause you to become dehydrated very quickly. Your body loses about one liter of water per hour on a regular hike. A challenging outing in hot weather usually doubles this amount. Ensure that you replenish constantly, otherwise you will dehydrate during your hike. Sweating is obvious when it comes to hiking in hot weather. As water is essential to restore your body fluid levels, it is just as important for restocking the electrolytes that you lose through sweat. The more important types are sodium and potassium. These play a vital role when it comes to managing energy levels. Bring along snacks that feature complex carbs. Avoid the simple carbs such as candy or sugary drinks. Good snacks include fruit or energy bars which offer a better source for complex carbs. Continuous hiking in hot weather is near to impossible. Your tired body needs few minutes to relax. Regular breaks on a hot day allow your body to cool down and sweat to evaporate. Hiking continuously in hot weather is close to impossible. Your body becomes tired, and you will need some time in between to relax. Regular breaks allows your body to cool down and sweat on your skin to evaporate. Put your backpack down, lay down, and give your body some much-needed rest. Drink water and have some snacks to restock your energy that will keep you going for the next few hours. Take your backpack off, sit or lie down to let your body get the rest it needs. In this time either eat snacks or drink water to restock the fuel and energy that you are going to need over the next leg of the journey. It is also a good idea to remove your socks and hiking boots to air your sweaty socks and feet. Keep in mind that your hike is not a race. If you start to feel fatigued, let other people in the group know that you want to stop to take a break. Know what symptoms are linked to heat stroke. Listen to your body, which will tell you when you can push forward, and when it’s time to take a break. Rest when you are tired and eat as soon as you feel hungry. If you are experiencing one or more of these symptoms, stop immediately and find a shady place, to cool your body down. When you hike in hot weather, try to wear lighter colors that will reflect the rays of the sun opposed to dark colors that absorb them. Look for pants, shorts or shirts in a khaki, tan or white color. It is best to wear hiking pants, a long sleeve shirt and good quality boots. The more you able to shield your skin the more comfortable you will feel. Choose boots that feature a breathable fabric, so that sweaty and wet feet will not become an issue during the hike. Choose clothes that fit loosely which allows for improved airflow while keeping you cooler. It is natural to assume mainly sunlight during the months of summer. Yet keep in mind that when you hike in the terrains with a higher altitude, the path will usually have its own weather system. While it might be humid and hot down town, in the mountains you may experience a monsoon. It is vital that you check with the weather bulletins before you head out onto a trail. If it is too hot, then simply change your plans and don’t go.